Macrophage. 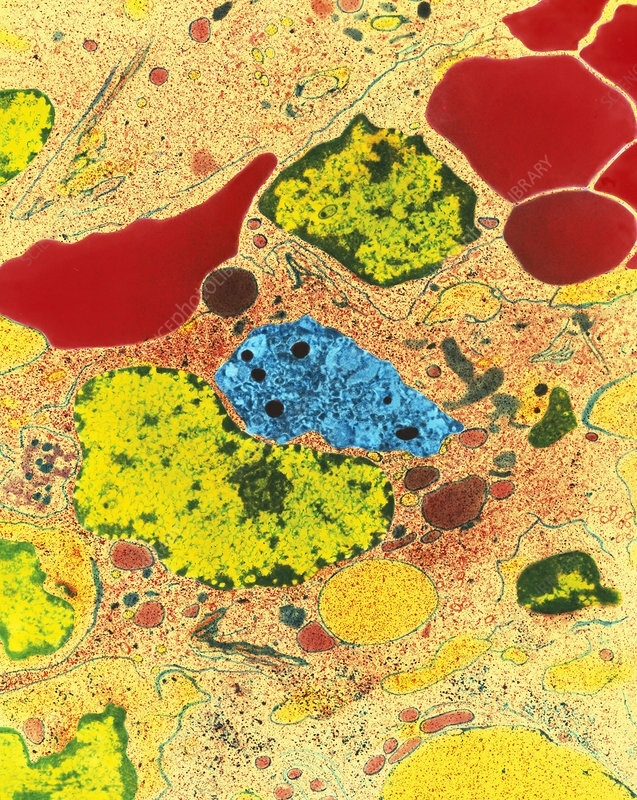 Coloured transmission electron micrograph (TEM) of a section through a spleen macrophage. This irregularly-shaped white blood cell (at centre) is surrounded by lymphocyte white blood cells (at bottom left & upper centre). Cell nuclei are green, with dark green chromatin. Red blood cells (red) are seen at upper left and top right. Lysosomes (dark pink) in the macrophage's brown cytoplasm contain digested red blood cells. Also visible in the cytoplasm are cell inclusions and ingested particles. Spleen macrophages ingest and destroy blood-borne foreign bodies and aged red blood cells. Magnification: x3,000 at 6x7cm size. Magnification: x10,300 at 7.5 x 9.5" size.